While the sun is making fewer appearances than Galway footballers in recent Connacht Finals at least the Galway social scene is hotting up. This week I was delighted to attend the official opening of Galway’s latest bar. 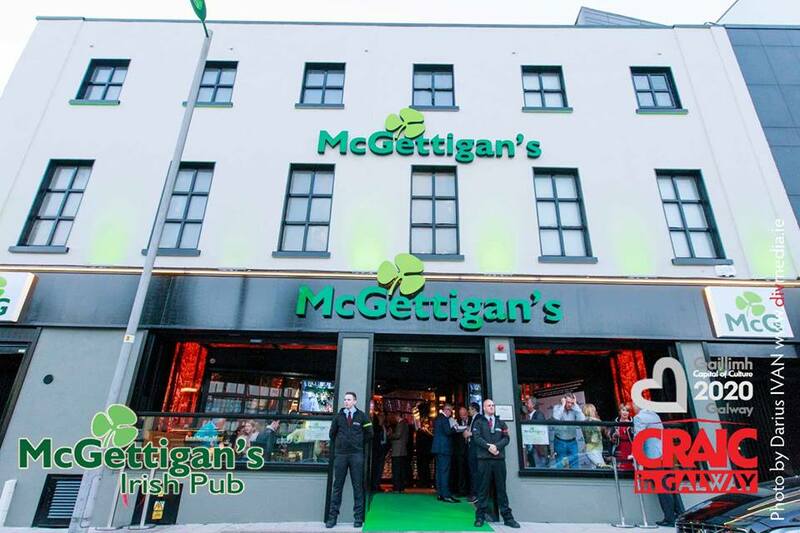 McGettigans Bar just off Eyre Sq on Prospect Hill opened its doors to reveal a beautifully decorated and welcome addition to the Galway nightlife. The old Cuba building has received an impressive facelift with no expense spared in the process. The opening night was a terrific affair with many familiar faces amongst the first visitors. Galway ‘A’ listers like Sile Seoige and myself we’re joined by stars of the GAA world such as Joe Bergin, Martin McHugh, Ollie Canning, Kevin Walsh, Anthony Cunningham, Alan Mullholland, former Galway manager and TD John O Mahoney was joined by party college Minister of Transport, Tourism and Sport Michael Ring who preformed the official opening; continuing the theme of the week another Mayo person coming up here getting all the glory. The glamour was supplied by the utterly delightful Pia Angels and massive Galway Player fans Sophia Small and Denise Manning with the gorgeous Laura Fox making a flying visit, not to mention my good friend Sam O Neill who was looking very dapper as usual. McGettigans already has three venues in Dubai with bars also in Abu Dhabi, Fujairah, Limerick, Donegal, Dublin, New York and Singapore. With Mundy playing a free gig on the first weekend I’m sure we can expect plenty of top names playing in the coming months. The food is excellent, given that it’s the open weekend that’s an impressive feat, I have been assured that cocktails are also a priority with over fifty on the menu. Whatever happens I’m delighted to see fifty new jobs being created and life being breathed such a great location. Eyre Square deserves a better nightlife and with An Pucan currently leading the way and other venues preparing to open I really hope that Galway’s already thriving nightlife continues to flourish. Big thanks to the ladies in Presence PR for the invite and Darius from Craic Magazine for permission to use the photos. Best of luck to all involved…..